Our two-layer infinity scarf is made of soft, fine knitted mohair angora wool blended with polyester. Keep warm and fashionable with this best selling scarf. Hand wash.
Show your pride with this Band Mom multi-strand bracelet. Adjustable length to fit most any size wrist. Easy open clasp. 2.25" diameter. 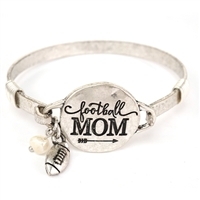 Football and faux pearl charm. Metal charm measures approximately 1". Incredible pendant necklace set with an inspirational message will go with any outfit! Mama Bear charm on 20" sterling silver chain. Gift box included with each order.